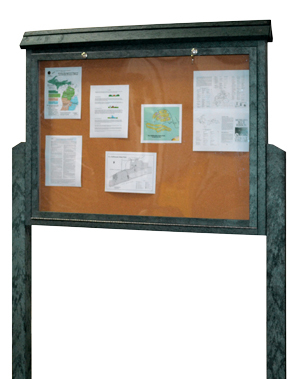 This watertight, enclosed information board is an excellent addition to any park, school, church, recreation center, or public area. The large display cork board leaves plenty of room for keeping everyone up-to-date or helping them find their way. Constructed of commercial quality, eco-friendly, maintenance-free recycled plastic and stainless steel hardware adding strength and durability for many years of use. Weatherproof seal keeps rain and moisture out. One piece stainless steel piano hinge runs the full length across the bottom of the swinging door. All hinge fasteners are internal, eliminating chance of screws being removed by vandals. Two weather resistant keyed barrel locks at the top. Scratch and shatter resistant polycarbonate window is safe around kids and provides much better scratch protection than acrylic. Bury the single or double sided message center posts directly in to the ground, or alternatively the single sided message center can be wall mounted. This message center can also be securely surface mounted in place using the optional anchor kit. UV Protectant colorant molded throughout the plastic to resist fading. Available in colors shown below.